The author has released his 24th edition of Textbook of Preventive and Social Medicine. 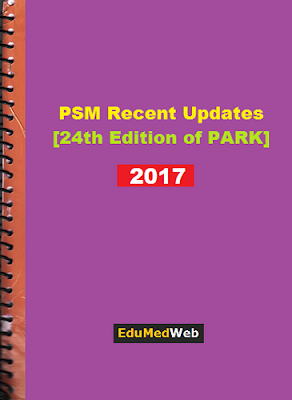 This new edition covers all the updates till 2017 and is important for all the medical students who are preparing for entrance exam. o Addition of global reference list of 100 core health indicators. o Mentioned about ICD 11.
o Addition of International classification of functioning and disability. o Changes in Immunization and Universal Immunization Program (UIP) for example shake test and new vaccines like JE, Rotavirus, injectable polio vaccine, pentavalent vaccine. o Addition of open vial policy of vaccines 2015.
o In Acute Respiratory Infection (ARI) and Acute Diarrheal Diseases (ADD): Addition of Integrated Global Action plan for prevention and control of Pneumonia and Diarrhoea by the year 2025.
o In Tuberculosis (TB): Changes in the statistics of incidence, prevalence and deaths due to tuberculosis. Introduction to daily treatment regimen under RNTCP program. New drug bedaquiline has been added for the treatment of XDR TB. Also, there is addition of End TB strategy. o In Polio Mellitus: Addition of Polio eradication and endgame strategic plan from the year 2013 to 2018. Introduction to the concept of National Switch Day has also been added. o In Dengue and Malaria: Figures for no. of cases and no. of deaths in the year 2015 have been changed. Addition of Zika Virus disease. o In Malaria: Addition of National framework for the elimination of malaria in India from 2016-2030.
o In Japanese Encephalitis (JE): Figures of no. of cases and no. of deaths due to JE have been added. Also, there is addition of JE vaccine. o In HIV AIDS: Addition of current statistics of no. of people living with HIV AIDS, new infections due to HIV AIDS and no. of deaths due to HIV AIDS. Prevalence of high risk group and antenatal population has also been added. Furthermore, there is addition of ART guidelines for the year 2016.
o Addition of Swach Bharath Abhiyaan. o Addition of RNTCP guidelines for daily regimen. o Whole new chapter has been added. o Only few changes in the statistics of population rest all the concepts are same. o In MCH indicators: Figures have been updated for the year 2015.
o Addition of Global strategy for women, children and adolescent health 2016-2030.
o Change in Juvenile Justice Act of 2015.
o Change in the figures on access to safe water and sanitation facilities. o Addition of biomedical waste management rules of 2016 where 4 colour coded category and category wise disposal of waste has been discussed. o Amendment in ESI act 2010 has been added. o Addition of draft of National health policy 2015.
o Rural Health Statistics and Indian Public Health Standards for sub centre, primary health centre and community health centre has been updated based on the revised 2012 guidelines.